Who honestly thinks about season’s greetings or yuletide carols in the month of May? This gal does! My name is Raleigh, and I’m a member of our Customer Experience team here at T&N. I also just so happen to help run our Surprise & Delight gifting program. I’ve sent quite a few gifts on behalf of T&N, which comes with a big responsibility of making the next holiday gift we curate and send even bigger, better, and more thoughtful. There are a few things to consider with such an important group of folks. By taking a few notes from John Ruhlin (author of Giftology and owner of Ruhlin Group - Expert Gift Givers) and gathering inspiration from our company’s unique brand and voice, I set off on a journey to make a universally delightful gift. A few things we keep in mind when gifting a partner or client is wanting them to be able to use every item in the package they receive. If we’re sending something that’s not useful, it may just end up in a drawer or tucked in the back of a closet until it’s time to spring clean. Finding useful and meaningful gifts is ideal, because it shows our partners that we want them to have quality items that improve their days, and also keeps us in their minds when they go to reach for the gift. Our brand has a very unique voice and style. Our team has worked hard to create a modern and relatable brand that not only speaks to our customers, but that also gives off a warm welcome to those who walk into our stores or our headquarters in downtown Phoenix. With a focus on our brand voice, a theme, and with the help of almost every team within our company, we were able to create something really special for our partners this year. This year’s gift was travel-inspired—but why? We wanted to choose a theme that touches everyone—and we all travel at some point, especially this time of year. Whether it be for business, fun, on a road trip, on a bi-weekly plane ride, on a bike ride across the US, or anywhere in between. Our team specifically loves to travel and we pride ourselves on having the ability for a stellar work-life balance at T&N, so it felt like a natural fit. We’re proud of the culture we’ve crafted and wanted to share that sense of adventure—combined with relaxation—with our business partners, as well. The gift we provided contains a sleek and minimal duffle from Boarding Pass NYC, along with one of their cheeky “This Bag Is Not Yours” luggage tags. We included a special and custom travel accessory that was created by our own Product Team to make sure it was the perfect fit for those who need a quick snooze on a long flight. We also wanted to highlight some of our favorite brands that the T&N team loves, so we featured a candle from Burn Candle Co. and some bourbon gummy bears from Sugarfina. But we didn’t stop there! We wanted to make sure that this not only looked like an on-brand gift, but also created an experience for the recipients. To do this, we worked with several people on different teams throughout our headquarters to collaborate on a special greeting card from all of us. This featured different suggestions of our teams’ favorite “downloadables,” such as podcasts, Netflix specials, and audiobooks that we all love. This added a personal touch while providing something of use. If you’re ever wondering whether it’s worth it to create your company’s holiday gifts in-house—do it! No one knows your brand voice or your partners better than you. It not only provides a thoughtfully curated experience for your business partners but also gets the team involved by flexing their creative muscles in a way that their typical day-to-day might not. 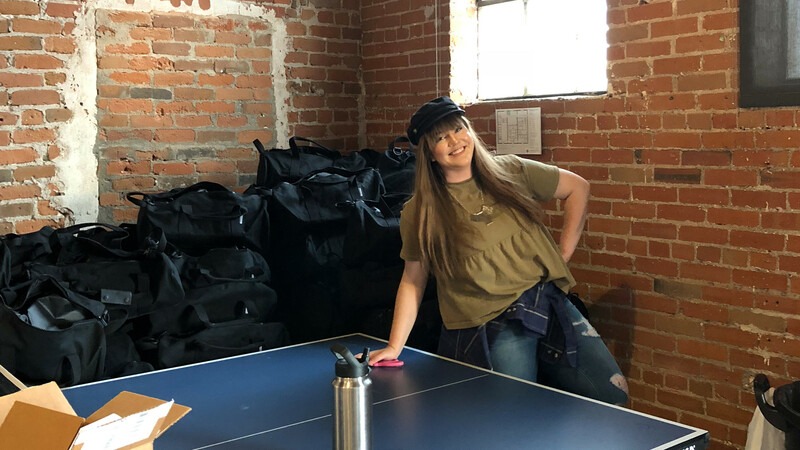 Raleigh Johnston is part of the Customer Experience team at Tuft & Needle, a Phoenix-based mattress company that’s dedicated to providing an exceptional and modern shopping experience in an industry in need of a wake-up call. She stumbled onto Tuft & Needle after relocating from Houston, TX, and was immediately drawn to the company’s caring and innovative culture - elements she was looking for in a career. These characteristics were put into play when she was given the opportunity to share her story with T&N customers after Hurricane Harvey’s devastation. Raleigh has an extensive background in retail management and visual merchandising, which has been utilized in her Customer Experience role and also in her position as a leader in T&N’s Downtown Phoenix retail location. On the trajectory to a career focused in fashion, she never knew that her latest role at a startup would lead her to having such a passion for snoozing.